It’s a whole new ballgame for boxing’s pound-for-pound superstar attraction GENNADY “GGG” GOLOVKIN! Golovkin (38-1-1, 34 KOs), from Karaganda, Kazakhstan, brings his Big Drama Show back to the “Mecca of Boxing” — Madison Square Garden for the first time in over two years in his eagerly-awaited DAZN debut on Saturday, June 8. 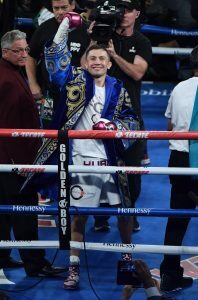 Golovkin, whose resume includes a record 20 consecutive middleweight title defenses (18 by way of knockout), has consistently drawn packed houses to the five previous events he has headlined at The Garden, dating back to 2013. He will rumble with undefeated Top-10 contender and Kronk Gym alumnus STEVE ROLLS (19-0, 10 KOs), from Toronto, Canada, in a battle, scheduled for 12 rounds, at a maximum weight of 164 lbs. Golovkin vs. Rolls kicks off the exclusive six-fight, three-year global partnership between GGG Promotions and DAZN, the world’s fastest-growing sports streaming platform.